I had never heard of the Aeropress Coffee Maker, until I was scanning the pages of Google looking for other ways to make great coffee. That’s when I happened across the AeroPress Coffee and Espresso Maker. …What is this weird looking coffee maker? The Aeropress is a coffee maker that offers an entirely new way to make espresso coffee without having to buy expensive espresso makers. It’s a simple device that mimics the method for making coffee by combining heat, time and pressure to make the perfect espresso drink. Aeropress coffee maker uses a total immersion technique as well as manual pressure to make coffee for espresso for lattes and cappuccinos. Lower temperatures and the short brew time mean that you won’t get the high acid levels you do with other methods. It’s very easy to operate the Aeropress coffee maker. You must first put the micro-filter in the bottom cap then twist the cap closed. Put two scoops of the coffee of your choice — any grind — in the chamber and place the chamber atop a sturdy mug. This video shows exactly how to use an Aeropress coffee maker. It’s a little bit long, at about 7 minutes. But stick around, it’s worth it. The video also mentions this device: the Aerolatte . Heat water to no more than 175°F, then pour it into the top and stir for about ten seconds. Insert the plunger and gently apply pressure. In a few seconds you’ll have a double espresso shot in your mug. This you can make into American style coffee by adding hot water. Or add hot milk and you have a delicious latte. If you want a full pot of coffee from the Aeropress coffee maker, simply do two 3-scoop pressings, top with hot water to taste and pour it into a vacuum carafe to keep it at the ideal temperature. The Aeropress can press from 1 to 4 scoops of coffee powder. And each scoop makes a single espresso drink or five ounces of American coffee. What IS the Aeropress Coffee Maker’s Secret? After reading the operating instructions you may wonder what the difference is between the Aeropress and a French press; after all, the process sounds much the same. However, the filter in the French press is at the top; since coffee floats the filter is often clogged, making cleaning difficult. It is recommended to use only coarsely ground coffee in a French press but that reduces the flavor that can be extracted. It also needs a longer steeping time which contributes to bitterness. The Aeropress is micro-filtered and particle free. Its chamber is self-cleaning and a ten second rinse of the plunger is all that’s required. So why use an Aeropress when you have a perfectly good drip coffee maker? Your drip process passes hot water through a bed of coffee grounds. The water is often too hot and makes the coffee bitter; as it seeps through the grounds it cools and therefore the extraction is weak. Grounds in the center of the bed are often scorched and over-extracted while grounds on the outside of the filter are under-extracted. It is nearly impossible to get coffee that tastes as it should with a drip coffee maker. There is a lot of flavor lost in the basket of coffee grounds before it even reaches your carafe or pot. However, the Aeropress coffee maker produces coffee that is micro-filtered to be particle free. 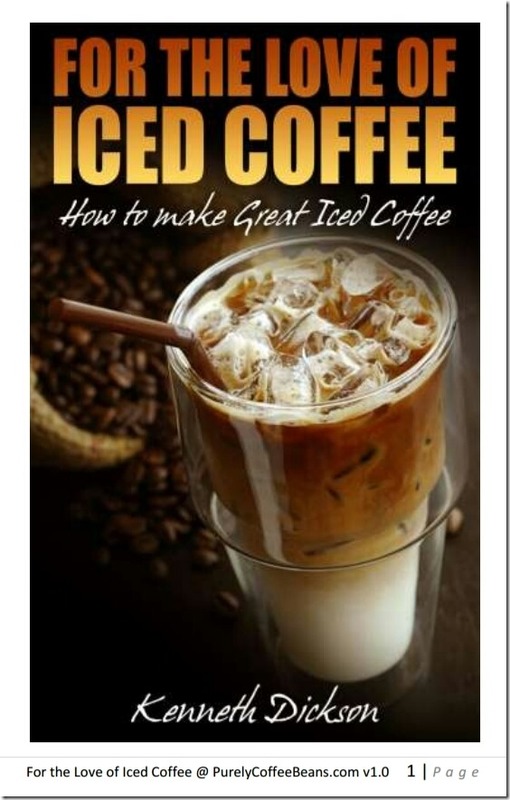 You can even store it for days as a concentrate for iced coffee or hot. 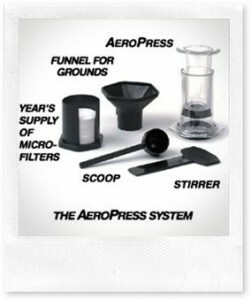 A lot of time and effort has gone into the creation of the Aeropress. Alan Adler, inventor and engineer, studied and experimented with various brewing methods and temperature settings as well as filtering methods. Adler created dozens of models before perfecting the one that impressed a coffee-lover like him — the Aeropress. In fact, Adler is no stranger to inventing and is the creator of the Aerobie flying ring, winner of the Guinness World record for farthest throw at 1,333 feet! He holds a wide range of patents as the result of his genius. Should I buy an Aeropress? 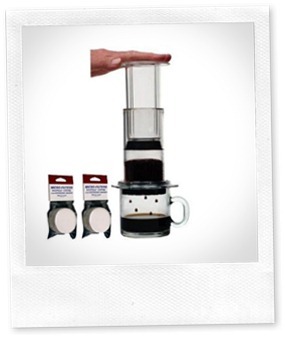 So let’s look at the advantages and disadvantages of buying an Aeropress Coffee Maker. The Aeropress is a very affordable espresso maker that produces a fine espresso drink with no grit as you might find in a French press. While you can brew almost any finely ground coffee, you may need to choose darker roasted espressos for best taste. Once made, the clean is straightforward, as you simply eject the ‘coffee cake’ afterwards, and rinse everything. The resulting coffee is quite strong, espresso like, and some drinkers may find adding water to make an ‘Americano’ style drink suitable for them. Maintenance is simple, too, as there are no electronics to replace. The filter papers are supplied with the unit, though you can either rinse them or buy new ones. With 300 in the box, that could be a long time away! With a little practice, you will find that you can make a great espresso, perhaps even achieving enough master to make a crema! And if you get the temperature of the water right, you will get a coffee with a very low acid, good body, and great flavor. One of the first things you will notice is just how much coffee an Aeropress actually uses. It’s a lot. Now I drink my coffee strong, so adding two scoops or three for me isn’t a problem. But for some coffee drinkers, this may be much more than they are used to. It does require a manual pressure to extract the coffee properly, but you don’t need to use a lot of force. For some coffee drinkers, this may be difficult for them because of injury or some other difficulty. You do need a firm even pressure, for sure. Many first time users have trouble controlling the variables in the process: the amount/type of coffee, the grind level, the water temperature, and the unit operation. So it will take you a little time to practice to get the variables right, including a thermometer for testing the water temperature accurately. Some users also grind either too rough or too fine, both of which result in problems. Too rough a grind, and the water just flows right through the coffee. Too fine, and the coffee absorbs everything leaving barely a couple of spoonfuls on the bottom! The results are indeed very pleasing even with the Cagliari pre-ground Espresso coffee that I tried it out initially with my Aeropress. The Aeropress Coffee Maker really makes a nice flavored espresso, but I can’t control the water temperature properly, it goes into the tube at 90C, and comes out in the cup at 55C! Now I reckon this is a little cooler than I’d normally drink espresso! Similar espresso shots from regular coffee makers definitely should be hotter than this. Tips to keep the drink hotter include warming the cup and probably the device before adding making the coffee. Cutting the time between shot and serving, too, would help. Use Lots of Coffee: Don’t be shy! The second issue I have is with the amount of coffee required to make a full four scoop shot. The size of the puck was huge, and the amount of coffee that came out didn’t seem that much larger than the double shot. Not sure what went wrong. However, I’ll just make double shots until the technique is perfected. I also found that the included coffee spoon takes approximately 15g of coffee, that’s about 50% more than the typical coffee spoon. We went through a regular 250g (approx. 8oz) pack of coffee in just 8 or 9 cups of double shots. I guess from reading the references that is about right. Certainly, when I go to the local coffee shop, I see the barista really packing the coffee in for my typical order. I think she uses 3 spoons of coffee in each shot, so I would guess that’s about 3x10g or the same as the aeropress spoon. While the espresso was a little cooler than I’d expect, once topped up with hot water, it really makes a decent Americano, and if you use hot milk, latte or cappuccino… Still to try those, though! The Aeropress coffee maker is a completely manual coffee making system that is sold at a compelling price. You simply make the coffee by using manual pressure to extract espresso coffee from coffee grounds. When you purchase the Aerobie system, you will usually receive everything you need to begin using it right away (minus the coffee, of course!). Included are the Aeropress, funnel, scoop, filter papers (x350!) and stirrer. Purchasing additional filters is recommended, but there aren’t any extras that you need to buy at all! Now how often can you see that?! I would not recommend this as a first time coffee machine because you will need to have some understanding of the different types of coffees, how to grind coffee, and how to make good coffee (like not using boiling water). If you regularly use a French press and/or other types of coffee makers, you may find this machine much easier to handle. If you can’t judge the temperature, consider buying a decent cooking thermometer. I purchased one and found it really helps to know what the temperature of the water is! Click check out more about the Aeropress Coffee and Espresso Maker , and purchase the device. You can also buy more filters, grinders, the Aerolatte and other Coffee Equipment. Visit the most amazing Aeropress site I found yet. It is World Aeropress Championships. It has lots of examples of real coffee lovers trying out new coffee making experiments with their Aeropresses! In short Lukasz’ Method seems to be the least complicated of the three finalists’ Aeropress Coffee Making Techniques. Now you try and see if you can invent a good variation!